While organizing and cataloging the Science Antiques Collection Wendy and I came across a wooden box, standing about a 18 inches high and 10 inches deep. Inside was a mechanism that appeared to be a brass structure inside what can only be described as a birdcage. The item slides out of its carrying case on a wooden platform, which can be removed and the piece therefore is able to be lifted out of its home. 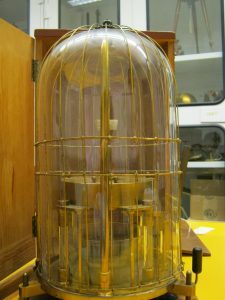 This is a Quadrant Electrometer, made by Elliott Bros. of London in the 1880s. It is a form of an electroscope, which allows more absolute measures of electrostatic potentials. This measures the presence and magnitude of a charge. When a device is attached to the contacts at the base of the machine, the needle floating inside points to the magnitude of the potential. This machine would have been used within a classroom setting, with students learning about electrostatics. Additionally, the aesthetic qualities of this object indicate that along with its practical use, an artistic use emerges as well. One can imagine such a machine sitting in the parlor room in the late nineteenth century, guests staring at the item while its proud owner explains the machines use and provenance, yet admiring the beauty of object. This and more aesthetically pleasing scientific instruments can be found in the 5th floor display in Bicentennial Hall. This entry was posted in Midd Blogosphere and tagged antique instrument collection, Armstrong, LIS Staff Interest, MuseumWorks on July 14, 2017 by Wendy Shook. On the first day of cataloging the vast array of equipment held in Bicentennial Hall, I came across a small wooden box. Inside the silk lined box are 31 hand blown glass beads with number painted on in gold paint, and a bone slide rule. Engraved on a small ivory plaque on the lid of the box are the words “Lovi Edinr Patentee.” After Wendy informed me that Edinr stands for Edinburgh, I quickly googled to find that they are aerometrical, or specific gravity, beads. 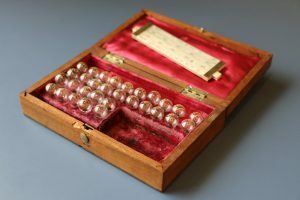 Beads such as these, also known as “philosophical beads”, were invented by Alexander Wilson of Glasgow in the 1750s, and were used to determine the specific gravity of a fluid. The user would drop the beads into a liquid until finding the one with neutral buoyancy, which would indicate the specific gravity. By using the slide rule, one could then, for example, find the alcohol content in wine. These beads turned out to be quite rare. These beads are an improved version, patented by Isabella Lovi in 1805. They presumably were handmade by Lovi, with only four, now five, known sets in existence. After further digging, we discovered that these beads were likely purchased by Professor Hall in 1809 during his trip in Europe, and were used in his lectures at Middlebury, as referenced by student Jonas Colburn in his 1815 notes. We are currently contacting the National Museum of Scotland, which owns other known sets, for more information. This entry was posted in Midd Blogosphere and tagged antique instrument collection, Armstrong, LIS Staff Interest, MuseumWorks on June 29, 2017 by Wendy Shook. 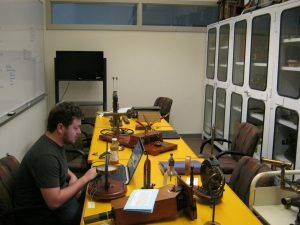 and art history, and he will be working on researching and cataloging items the Antique Scientific Instruments collection, and learning about digital preservation. In the end, we hope to digitize a subset of the collection – including 3-D scanning! – and he will create a new exhibit for the Armstrong lobby area. He has already discovered treasure in the collection, so we will be positing semi-regularly on the exciting find-of-the-week. Stay tuned! This entry was posted in Midd Blogosphere and tagged Armstrong, LIS Staff Interest, MuseumWorks, science, scientific instrument collection on June 13, 2017 by Wendy Shook.